Ever feel like there’s a bouncer blocking you out of getting a job interview? Image by Pheonix2011 at Bitstrips.com. Are you frustrated after sending out hundreds of job applications without getting a call back to schedule an interview? Does it seem like an evil job gate keeper is blocking you from the job like a bouncer that only lets in attactive 20 year-olds? You’re not alone. Most job applications do fail to lead to job interviews. But it doesn’t have to be this way. A few applications always stand out from the rest and make recruiters take notice. I’m going to tell you how to fix your approach so your applications will be one of those stand outs. I confess. I’m one of the gatekeepers here at Stafflink. I screen the applications that come in via our job list page. Every time I look at an application I’m hopeful. Maybe this one is qualified. If the applicant lives near the job site, and appears to be at least somewhat qualified, I flip their application over to the recruiter. Then, if the recruiter is still actively looking for new canidates for that job, they will review the application. 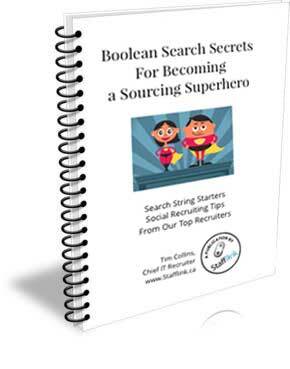 If the applicant appears to be qualified on paper, that’s when the recruiter picks up and gives them a call. So you have to make it through at least two checkpoints before you ever receive that first call. You can tip the balance in your favour by being more strategic with your applications. Yes, the IT job market is super competitive. But you have some great skills and experience that will make you highly valuable to a company you work for. That company needs you! So don’t waste another minute of your valuable time sending out applications that company gatekeepers will ignore. Instead, put your time into sending job applications that have a good chance of putting you in front of the decision makers that can hire you. Not qualified. Most of the applications we receive are from people who do not have the basic qualifications that are listed in the job requirements section of the job posting. It’s like they only read the job title and then clicked “Apply”. No summary of qualifications. The person attaches their resume to an email but does not tell us about their key qualifications. We get so many job applications, that it is unlikely we will take the time to open someone’s resume unless we know it’s worth the effort. General applications. The person expects us to read their resume and then figure out if we have a job for them. They do not even mention their area of specialization. 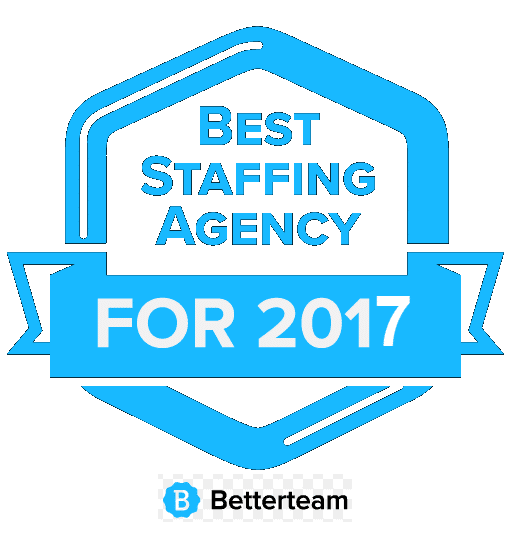 Their resume may get parsed into our candidate database, but it is very unlikely that we will comb through their resume to figure out if they are a match for one of our jobs. Bad Timing. The person is applying to a job that has been posted for a while and is probably in the final selection stage. Which means that the company is not really paying attention to new applications because they already have a job offer out. Too much competition. If a company is receiving hundreds of applications for the job, after a few days they will start filtering most of the applications into their database. Sorry! That’s just the reality. Don’t lose hope! You can fix all of these problems if you are willing to be realistic about your job applications. What causes so many people to have unrealistic expectations when they are searching for a job? Skimming the Job Post: People are programmed to skim when they are reading online. Job postings are especially difficult to read because they usually contain lists of responsibilities and requirements that our minds blend together into “blah blah blah”. We see the job title and think, “No problem. I can do that blind-folded with my hands tied behind my back.” And then flip off a copy of our resume to apply for the job. Losing Hope: When you’ve sent out a hundred applications with no success, you think “Why bother?” So you don’t put any effort into writing an approach email that proves that your resume is worth looking at. After a while you don’t even bother writing the name of actual job you are applying for in the subject line and you just start spamming out general applications. Now I will tell you some simple things you can do to improve your job applications so that you will have a much better chance of getting interviews. Only apply to jobs you are truly qualified for. Read the job posting carefully. The skills and job experience that you list on your resume should reflect the required skills listed in the job posting. Put the exact keywords in your resume that are listed in the job requirments. Hook the hiring manager or recruiter with your application email. Say exactly why you are qualified for the job with a few bullet points that highlight the experience you have that is directly in line with the job description. Be exceptional. Mention the most impressive experience you have right up front in your email and resume. Especially if you’ve worked for well known companies. Received an impressive award. Achieved something spectacular that made your former employer more successful. Use numbers to prove your achievements. Location, location, location: Lots of job applications get overlooked because we are looking for a local person to fill the job but it looks like the job applicant lives far away from the job site. If you live near the job site, make that clear in your application email and at the top of your resume. Provide accurate contact info: Make sure to put a working phone number and the correct email to reach you in your application email and on your resume. Don’t apply to too many jobs at one company. If you continuously apply to jobs at the same company, they will notice and they will stop opening your application. Network. Develop a relationship with people at the company by following them on LinkedIn, Twitter, Google+ and Facebook. Read and comment on their posts and blogs. But don’t overdo it. You don’t ever want to appear desperate. Follow up on your job applications to find out if you will be moving to the next level in the application process. Prepare a memorable 1 minute speech about the unique, exceptional contribution you can make. This will be critical to your success every time someone calls you for a telephone screening to decide if you should be scheduled in for an in-person interview. Is the job application proccess unfair? Do you agree the most job applications fail because people have unrealistic expectations about the job search process? 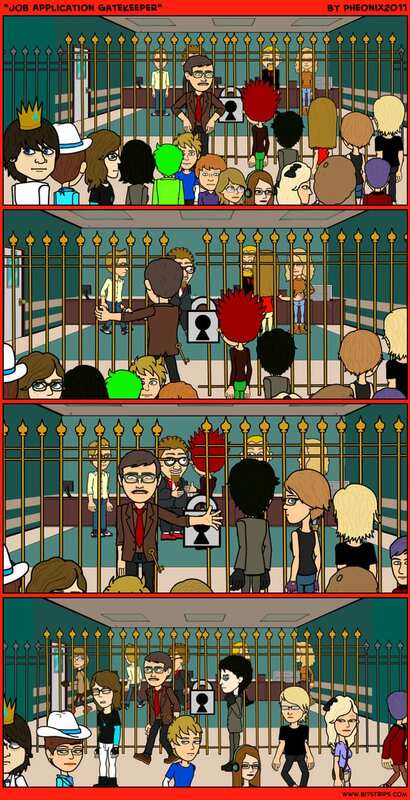 Let me know what you think in the comment section below this “Job Application Gatekeeper” image that was created on Bitstrips.com by a talented kid I happen to know. Hello Laura; That is a nice thought from you about matching everyone with the perfect job. It would be “heaven on earth” as so many people are depressed and feel rejected these days by being unemployed for long periods without any hope in sight. We all have unique gifts and these would be ideal tools in the work place (if only our gifts could be accepted and given the chance to show their qualities). Maybe one day your wish will come true I hope so as I like many others would love to do a meaningful and worthwhile job again some day. I love your point that everyone has unique gifts. When you find a job that let’s you use your gifts, that’s heaven on earth. Have you seen the blog Work Happy Now? It’s all about uncovering your superpowers and putting them to work.